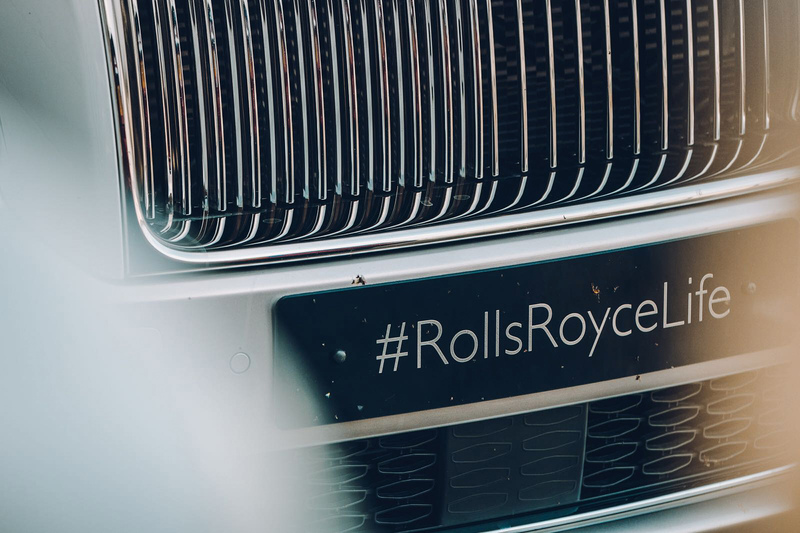 For those of you familiar with Chichester, you’ve probably heard of it for two glorious reasons; the eponymous Goodwood circuit, and for being the home of luxury automotive legacy that is Rolls-Royce Motor Cars. These two brands are kindred spirits; linchpins in their respective ways and brands to which modern and vintage motoring owes so much. Constructed during World War II, the Goodwood Circuit actually began life as the perimeter track for the RAF, before eventually hosting its first motor race on the 18th September 1948. A wide loping track, renowned for the ‘simplicity’ in design as much as its difficulty to drive, with the wide track having little run off leaving very scant room for error; this was the track after all that McLaren Automotive founder Bruce McLaren tragically lost his life. Since its early racing days little has changed in so far as track design, with a chicane added to test bravery and skill on the final run in, other than that the circuit remains much the same, adding both to its historic appeal and its mysticism. 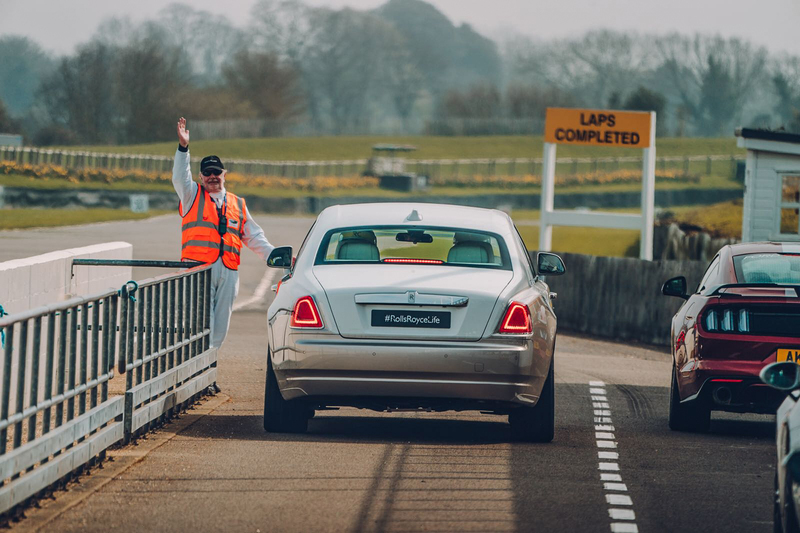 This was the challenge awaiting the 2018 Rolls-Royce Ghost that I had prepped to drive around the famed circuit. 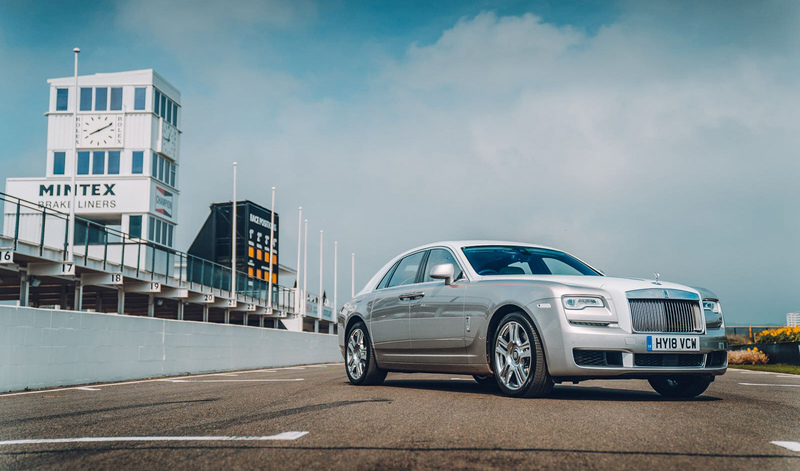 This is one of the very first model year 2018 Ghosts, finished in Arctic White over Premiere Metallic, with a bespoke silver Spirit of Ecstasy proudly displayed at the helm. It’s fair to say that this is not a car that you would consider as being made for the track. 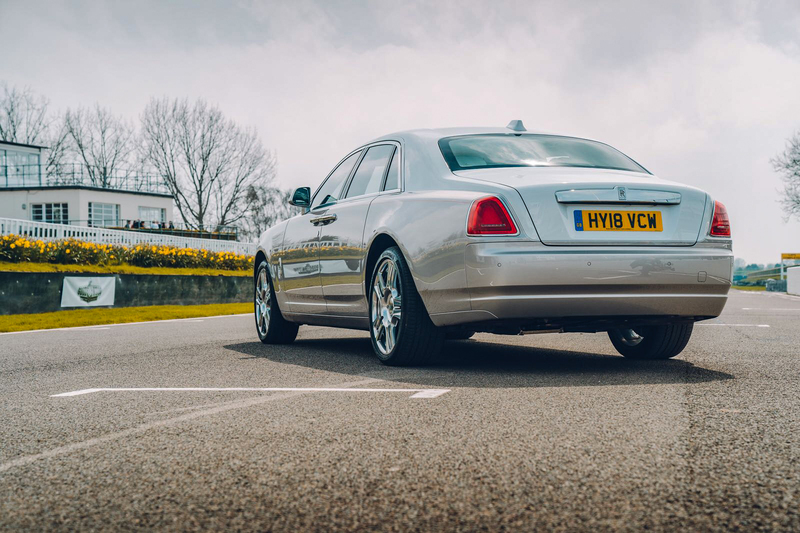 That’s not to say that the car is ill equipped for speed and handling, the 6.6 litre v12 under the elongated bonnet a testament to that, but the very nature of the car’s make-up almost entices you to relax. 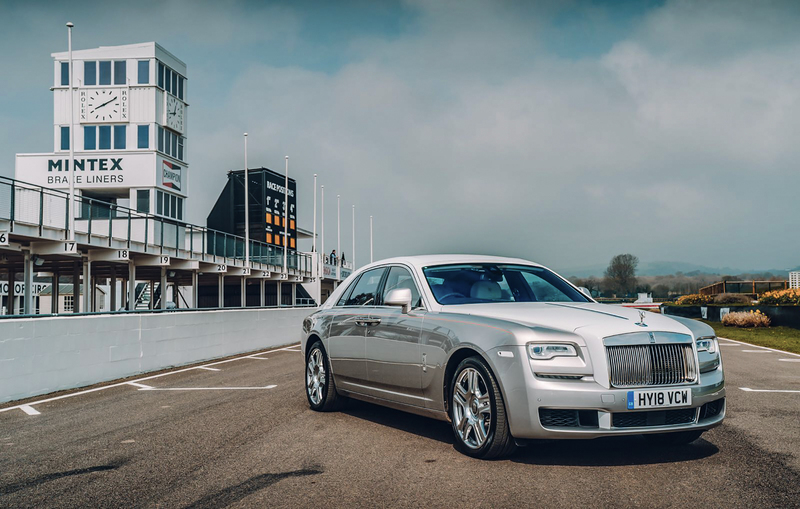 My first lap around the Goodwood circuit was tentative to say the least – to be quite honest – as it felt somewhat disrespectful to be throwing a car of this ilk around a race track, regardless of whether it could handle it or not. Look around and you see plush leather circumventing you as subtle touches of luxury punctuate the interior at regular intervals, with the “RR” monogram inlaid in the Paldao wood veneer. Even when encouraging the engine, you are drawn into sofa-esque soft seats as the Ghost accelerates. On the second lap, however, it was the famed circuit’s turn to make me feel disrespectful, as I reflected on all the greats that had driven this track, the automotive heritage surrounding me and I couldn’t help but take a more aggressive approach. I lowered the suspension and engaged the Ghost’s equivalent of a “Sport” mode by pressing the button labelled “Low” on the gear stick. This immediately felt more like it as the gears were held longer between shifts while the handling felt neat enough to take a tighter line all-round. 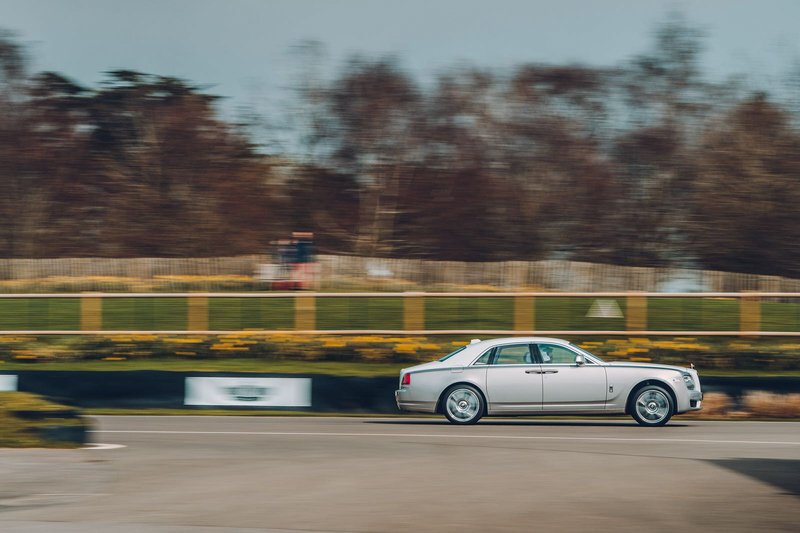 The third lap saw me bolder still, with the v12 now in full voice as the Ghost and myself made ourselves at home on the Goodwood circuit, inhibitors well and truly now to one side. Does the Ghost handle the track like a sports car? No, it’s much softer than that, but that doesn’t necessarily mean that it lacks speed. 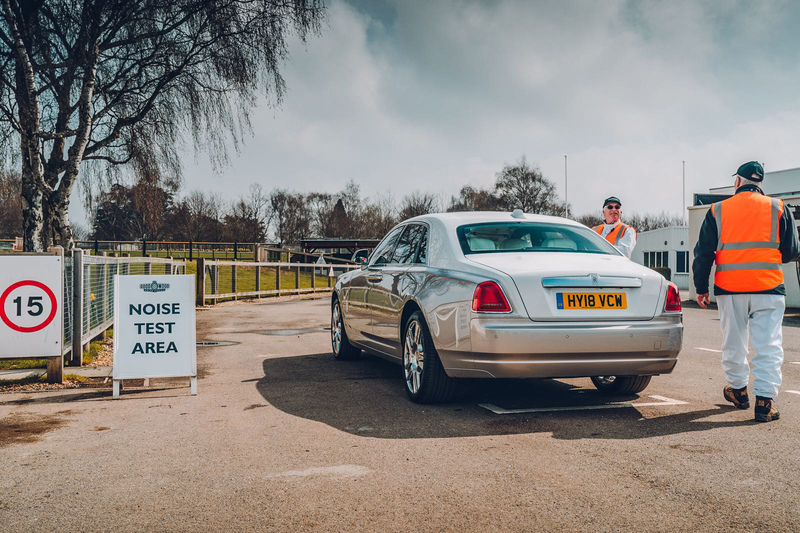 This is to be expected from a car equipped with a suspension system designed to take every bump and jolt out of your journey, softening their impact to such an extent that – to use the proverbial tale – even a “Princess” wouldn’t feel a “pea”. As I pitted and exited the Ghost, I couldn’t help but smile as a sense of satisfaction took the place of anticipation. I removed my helmet and proceeded get myself a much-needed coffee; mission accomplished, I had done both brands justice- in my opinion at least anyway.